Hello everyone! Thanks for stopping in to party with us at Snickerdoodle Sunday!! We totally missed hanging out with you last weekend but know we thought about you guys all week! We hope you had a totally awesome time over the holiday weekend and are ready to party with us today! We are so happy to have everyone here, you are all invited to kick back, enjoy the party and help yourselves to some cookies! This week we have a super special co-host - Sarah from Sadieseasongoods! She hosted a few weeks ago and came back to hang with us this week! Please stop by and give her a warm welcome! Find Sadie Seasongoods on her Blog, Facebook, Instagram, Etsy, and Pinterest. Each month we will also do a round up of the most viewed/hostesses fav links so we all get some extra exposure. Make sure you follow all the hostesses so you can check if you are featured! Erica from Erica's recipes!! Congrats Erica! 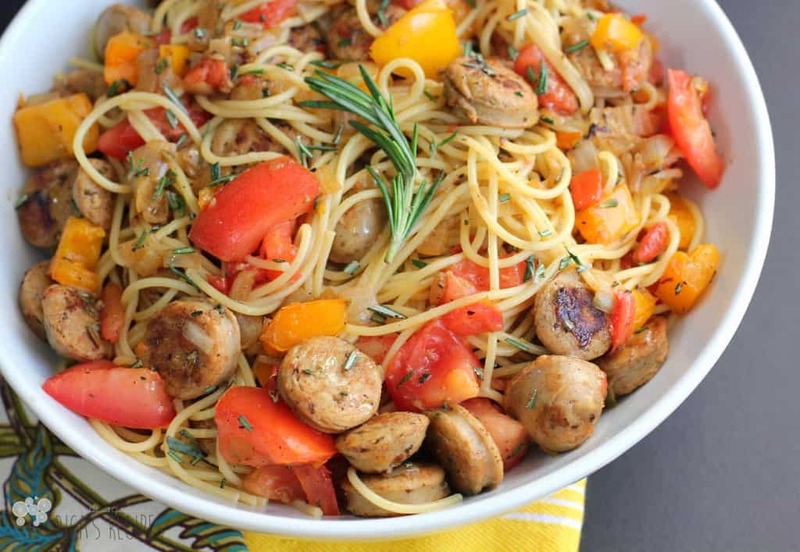 Our end of June co-host, Paris @ My Big Fat Happy Life picked Erica's Chicken Sausage and Rosemary Spaghetti as the most delish post! Oh my goodness! so mouthwateringly delish!! Don't you want to just dive in and nom?!?! Hello! I'm Erica ...wife, mother, and scientist, passionate about triathlons and pizza. Join me on my quest to enjoy all things food - both healthy and indulgent. After all, life is about balance right? Congrats Erica! Here's your super special cookie! Everyone stop by, say congrats and check out all the fun and excitement going on in Erica's kitchen! Now that we have had our delish meal and some yummy dessert - time to PARTY! !